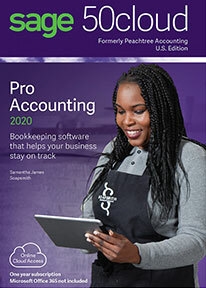 Sage 50 Pro Accounting provides easy-to-use tools to help manage your expanding business needs. Based on real, double-entry accounting principles, it includes features such as inventory management, business analytics, payroll, and customizable reports. Choose Sage Sage 50 Pro Accounting if your growing business has more people, sales and transactions to manage. With payroll, customizable dashboards, email reminders and integration with Microsoft Word and Excel, Sage 50 Pro Accounting will help you stay on track.